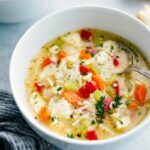 A chicken broth-based soup chock-full with good for you vegetables, shredded chicken, rice, and seasonings. A hearty, healthy, and delicious soup. There are a few short-cuts that make this soup so fast. The first is using rotisserie chicken. 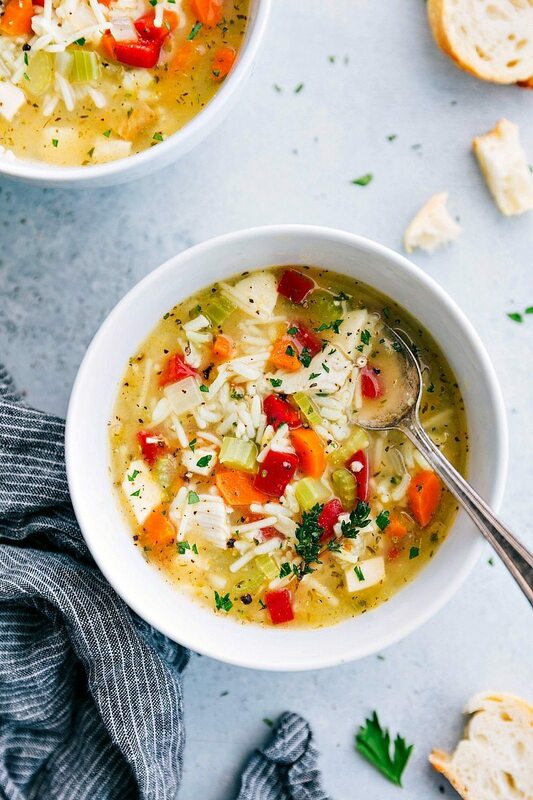 We love rotisserie chicken because it’s already seasoned and so flavorful plus the chicken is already cooked making this soup whip up even quicker. That said, if you don’t mind spending a little extra time you can cook your own chicken for this soup and then shred it and add it in. The second short-cut is a packet of seasoned rice. This serves two purposes — first, the rice can cook in the soup and second, there are a ton of extra seasoning which eliminates measuring out a whole bunch of seasonings. The last short-cut that is totally optional is buying some pre-cut veggies. Most grocery stores sell mirepoix which is pre-chopped veggies (celery, onion, and carrots). If you grab that, you’ll only need to chop up the red pepper. The one thing to note with this recipe — if you want to have leftovers, cook the rice separately and add it individually to each bowl. If you don’t, it bloats up in the liquid and gets “soggy” after being stored in the fridge. A chicken broth based soup chock-full with good for you vegetables, shredded chicken, rice, and seasonings. 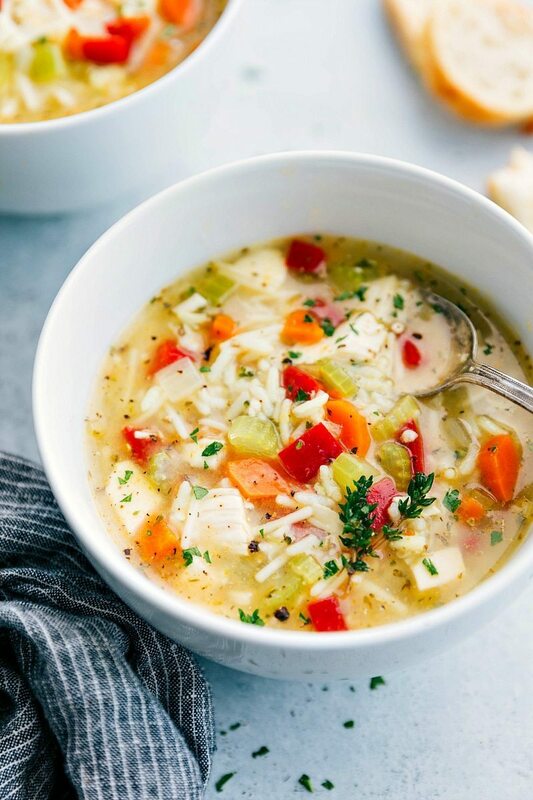 A hearty, healthy, and delicious soup. Heat butter and olive oil in a dutch oven over medium-high heat. Once the butter is melted, add the chopped pepper, diced onion, diced carrot, diced celery, and thyme. Stir occasionally, until vegetables are tender, about 8-10 minutes. Add broth or stock, water, and the package of rice sides. Bring to a boil. Reduce heat and cook covered 10 minutes or until rice is tender. Meanwhile, shred or chop the rotisserie chicken. Stir in chicken and serve immediately. Season to taste with salt and pepper. Top with fresh parsley and fresh thyme if desired. Add some parmesan cheese to each bowl if desired. Best enjoyed the same day it is made or the rice tends to bloat. 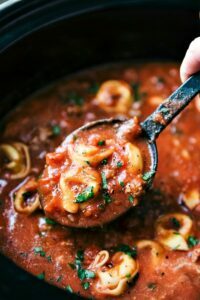 I love the step by step photos for this recipe; it looks delicious! Yes there are a lot of thing I love about winter but I’m going to admit, soup is top on the list!! Now that the cold is rearing its ugly head again, this will sure hit the spot! Looks great girl. We love chicken rice soup! It’s one of our favs around here. Beautiful photos! Love how jam-packed that soup is! I’m not a fan when a soup is too brothy, but this looks perfect! Yum! This is just what I need right now! Haha exactly! 🙁 It snowed where I am at today! Thanks for the pin Jenn! 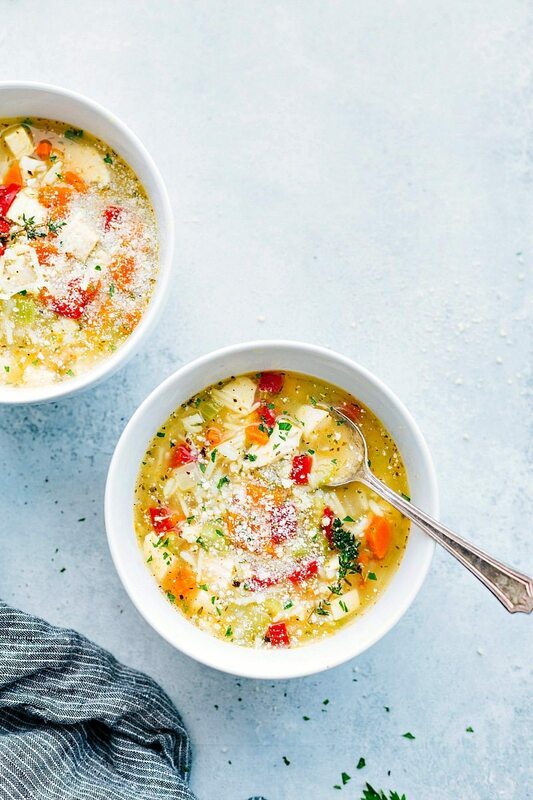 I love soup all year round, but we definitely eat more of it in the winter because then my hubby considers it an acceptable dinner too 🙂 Love this! This looks healthy and delicious. Thanks for linking up to the link party. I hope to make this soon. This soup looks amazing, Chelsea. 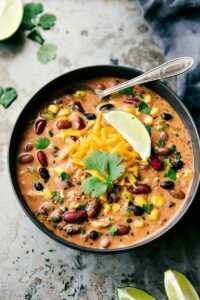 Soup has become our best friend during these crazy temperatures and I am constantly looking for new recipes to try. Using a Knorr Side is such a fabulous idea. Can’t wait to whip this up!! Read this in my email and went ohh yummy. 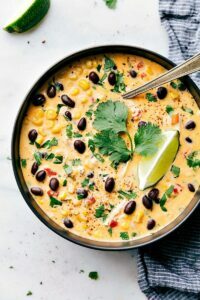 This soup looks very delicious and filling!